Few falls have held the excitement of as many new students as 2004 has at Sam Houston State University, now in its 125th year of service. Memo to the Sam Houston State University pastry chef: Add another layer to the eight-foot wide birthday cake you're planning for the university's 125th birthday party Oct. 12. Fall enrollment figures released this week show that as many as 14,371 students, a new record, could show up for the party and panoramic photo that day on the west campus intramural field, along with hundreds of faculty and staff. The enrollment record is the fourth straight. That's 911 more than last fall--an increase of almost 7 percent. There are 312 more freshmen, an increase of 17 percent in that category. And everyone has heard about the "freshman 15" average weight gain, so maybe that cake should have more than one extra layer. 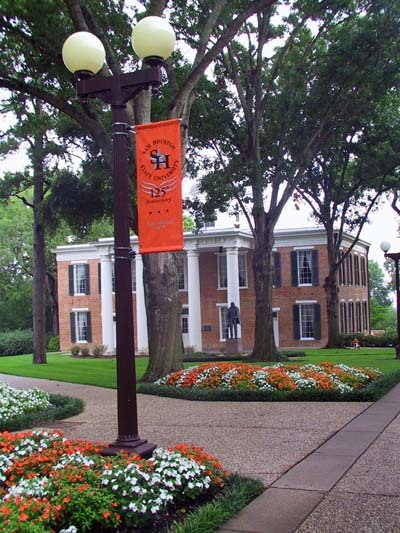 Established in 1879 as Sam Houston Normal Institute, the first teacher-training institution in the Southwest, Sam Houston has diversified into four colleges other than education, and things are really hopping on the campus where its namesake Texas hero once lived. President James F. Gaertner, who took over in the fall of 2001, often points out that only six of 36 public Texas universities qualify for a higher Carnegie classification, based on number of doctorates. SHSU also offers 87 bachelor's and 47 master's programs. State rankings have also increased in student academic qualifications, after the university raised admissions standards in 2002. Last fall with the state average SAT at 993, Sam Houston State's was 1010, and this fall it is up to 1013. The most visible changes around the general's old homestead, in addition to more cars in the parking lots and more students in the classrooms, have been in construction, renovation, and improvement projects totaling more than $100 million since 2002. These have included two new apartment complexes of more than 1,000 beds, a business administration addition, science facility renovation and addition, baseball/softball complex, recreation center, visitor center, new campus signage and gateways, and the institution's first indoor parking garage. The revitalization has not been limited to the campus interior. One of the new projects is the $19 million Sam Houston Village, built on the site of a dilapidated motel and bowling alley complex that badly needed removal. That project is spurring economic development along Sam Houston Ave. from the Sam Houston Memorial Museum to the Walker County Courthouse. Another reason cited for SHSU's recent success in attracting students is that Interstate Highway 45 running north out of Houston seems to somehow have gotten shorter. With more than 34,000 alumni in Houston and nearby cities, and more than 50 percent of Sam's students coming from Harris and surrounding counties, SHSU has even more involvement now with its participation in the University Center in The Woodlands. This fall with 2,588 enrolled there, SHSU can claim about three out of every four students attending classes offered by the six cooperating institutions, that include Texas A&M, University of Houston, UH Downtown, Texas Southern and Prairie View. SHSU offers 22 programs in which you can obtain degrees at the University Center without ever having to set foot on the Huntsville campus. SHSU's recent academic thrust has been to add rare or otherwise unavailable "niche" programs, such as a banking program that offers the only undergraduate degree of its kind in Texas, a forensic science program with a similar distinction, and a victim studies degree that is unique nationally. Before Gaertner became SHSU's 12th president, he worked for the University of Notre Dame and the University of Texas at San Antonio. One of his other initiatives has been quadrupling the size of the SHSU advancement staff planning SHSU's first capital campaign. He has asked academic administrators to find ways to give faculty more time to do research, with the goal of a nine-hour per semester teaching load. He wants more units like the Department of History, where 11 of 15 faculty members have authored books, and the department chair, James Olson, with more than 40 books, is one of the most prolific writers on any university campus in the United States. With many of SHSU's students the first in their families to attend college, the university is working hard to increase retention and graduation rates. The SAMCenter counseling center is attracting national attention for its proactive approach to retention. The SAMCenter counselors don't just sit around waiting for students to walk in asking for help. They have a system in place in which faculty members call them about students who may be struggling, and the counselors contact the students before serious damage occurs. Local folks who feel unappreciated, on college campuses and elsewhere, often say that this or that is a "best kept secret." When Gaertner took over he echoed that sentiment, saying, "I'm convinced that our quality is way ahead of our image." At Sam Houston State University, in historic Huntsville, that may be changing.